fights atherosclerosis and little-known risk factors. This preventive formulation is aimed at anyone at risk of cardiovascular problems, whether as a result of certain diseases (diabetes, atherosclerosis, heart arrhythmia), an unhealthy lifestyle (poor diet, lack of exercise, smoking, abdominal fat, alcohol consumption, chronic stress) or simply the body’s normal ageing process (decline in heart function, age-related changes to blood vessels, etc.). From the age of 40 onwards, there’s a sharp increase in the risk of problems linked to the heart and circulation. The formulation’s efficacy is due to the complementary and synergistic effects of its natural ingredients, all of which have demonstrated key benefits in the prevention and treatment of cardiovascular problems. Homocysteine is a sulphur-containing amino acid which is produced via dietary protein. However, it is important to know that like conventional risk factors, an increase in circulating homocysteine levels is now considered a major determinant of cardiovascular disease and thrombosis. Pyridoxal-5-phosphate, an optimal form of vitamin B6, 5-methyltetrahydrofolate and methylcobalamin, a form of vitamin B12 preferred to cyanocobalamin, are all recognised treatments for lowering homocysteine levels and thus reducing risk of cardiovascular disease, and all three have been added to Triple Protect. Quercetin is undoubtedly the best-known of the flavonoids. This famous anti-ageing substance, which is largely responsible for the therapeutic effects of ginkgo and hypericum, lowers blood pressure in people with hypertension, reduces levels of ‘bad’ LDL-cholesterol in overweight individuals and inhibits platelet aggregation, a mechanism involved in atherosclerosis. In just the last few years, it has also been associated with reducing the fragility of capillaries. When we think about cardiovascular-protective supplements, magnesium springs to mind with its recognised and convergent effects. It helps to both prevent atherosclerosis (by reducing absorption of lipids in the gut during meals, as well as by increasing levels of ‘good’ cholesterol) and lower blood pressure. With scientifically supported and recognised effects, an elevated daily intake of magnesium is indeed recommended by US medical authorities for preventing and treating hypertension. This is why SuperSmart has chosen the most actively-absorbed form (magnesium bisglycinate chelate) for its Triple Protect formulation. Our formulation also contains R-alpha lipoic acid, which is converted in the body into dihydrolipoic acid. This powerful antioxidant can regenerate other endogenous antioxidants such as vitamins E and C and glutathione, thus helping to prevent damage to blood vessels from oxidative stress. A number of studies have also shown that it increases insulin sensitivity in type 2 diabetics who are at greater risk of cardiovascular problems. Also included in Triple Protect is an extract of maritime pine bark standardised in proanthocyanidins or oligo-proanthocyanidins (OPC). This too is invaluable in preventing circulation-related problems. Studies show it has a slight effect in both lowering systolic blood pressure and increasing physical capacity, reduces several risk markers for cardiovascular disease such as inflammation, improves microcirculation, decreases the capillary permeability that contributes to oedema and relieves symptoms related to venous insufficiency. Nattokinase, an enzyme produced by certain bacteria which is able to inactivate plasminogen activator inhibitor 1 (or PAI-1), thus helping to dissolve blood clots and prevent the formation of thromboses. As such, it is a ‘mild’ anticoagulant which must be borne in mind if you are taking anticoagulant drugs such as Previscan® or Eliquis®. It therefore plays a supporting role to vitamin K2 in cardiovascular health and can be combined with a formulation designed to target blood clots called Cardio-Clear™. Extract of pomegranate seeds also feature in this product. Currently the object of considerable scientific interest due to its high content in ellagic tannins, the pomegranate has a positive effect on prostate health as well as on cardiac muscle. However, in order to obtain these benefits, it is important to choose a high quality extract with a guaranteed content in ellagic acid and punicalagins, as is the case with Triple Protect. Drinking pomegranate juice only makes sense when it is pure, freshly-pressed, undiluted and unsweetened. Last but not least, Triple Protect features allicin, an organo-sulphur compound present at minimal concentrations in garlic extract which has anti-bacterial and anti-fungal properties. The many health virtues of garlic are undoubtedly due to its content in allicin which, when concentrated, increases production of the vasodilator nitric oxide, also available in Nitric Oxide Formula. Allicin’s ‘cardiovascular credentials’ are also thought to include blood pressure-lowering properties. 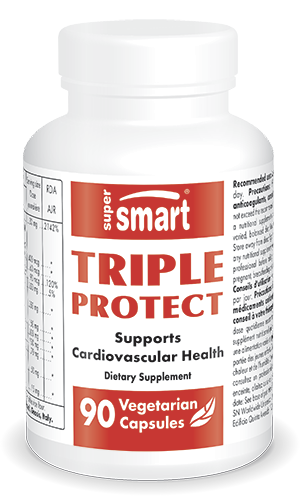 Given all these elements, it is difficult to conceive of a more effective natural formulation than Triple Protect for protecting against diseases and symptoms related to circulation, coagulation and cardiovascular problems and their complications. Each of its ingredients has been included in its most active and absorbable form, based on the very latest scientific research. But it is undoubtedly the synergistic combination of all these elements that makes it a truly exceptional product. In Western countries, cardiovascular disease is the leading cause of death among women and the over-65s. In France, for example, it claims 150,000 lives each year, often suddenly and without warning. Yet prevention is not only possible, it is at the forefront of the latest scientific knowledge thanks to Triple Protect. Note: it is, however, advisable to consult your therapist before taking this product, especially if you have been prescribed blood pressure-lowering or anticoagulant drugs. In the absence of any such contraindication, beneficial effects are felt rapidly when used regularly three to six months, and this can be repeated depending on the results. Other ingredients : magnesium stearate, microcrystalline cellulose. Quatrefolic®, Gnosis, Italie. adults. Take three capsules a day. Consult your therapist first if you are taking anticoagulants.